Runners take off from the start of the the 36th Annual All-America City 10K Run/Walk on Saturday, Feb. 3, 2018, in Edinburg. EDINBURG — Overcast skies Saturday morning didn’t deter more than 8,000 runners from participating in the 36th Annual All-America City 10K Run/Walk, Fun Run and Miracle Mile, breaking last year’s record of approximately 7,050. 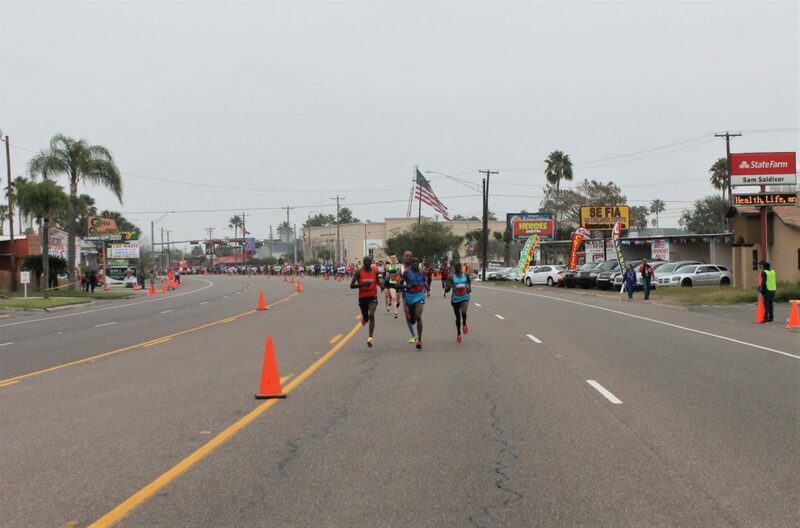 Starting out on Palm Drive, the 10K race with 3,004 participants began at 9 a.m. sharp with a field of elite runners, including participants from Mexico, Kenya, Ethiopia and Israel at the front of the line with other runners following. Once the gun was fired, the 36th annual race stretched through the streets of Edinburg, travelling down Closner Boulevard onto University Drive then passing by Edinburg City Hall, the Edinburg school district Administration Building, then the Hidalgo County Courthouse and wrapping up at Richard R. Flores Stadium. Elsa resident Edna Rodriguez began her running journey nearly three years ago. 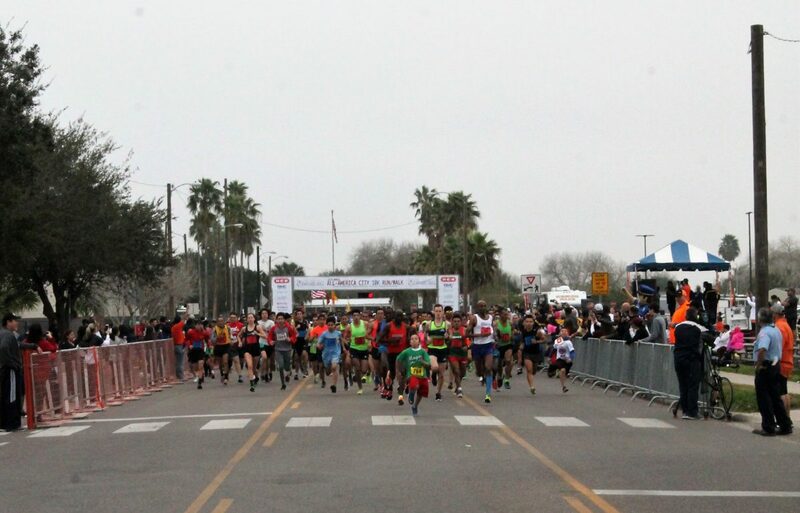 Elite runners including Kenyans and Ethiopians run down Closner Boulevard at the head of the pack during the 36th Annual All-America City 10K Run/Walk on Saturday, Feb. 3, 2018, in Edinburg. Rodriguez said she likes to compete and has completed marathons in San Antonio, Las Vegas and California. She also trains before beginning any type of event by using a phone application. She runs, walks, and does CrossFit training to prepare for each run and she decided to take on this year’s 10K to break a personal record. Another runner was Jorge Arias from Mission, who decided to participate in his first 10K because of family. Since Arias is new to distance running, he wanted to take it slow by jogging and walking throughout the 10K. Longtime Edinburg resident Joe Cantu said he has been running all his life and still enjoys doing so every day. Cantu likes the feeling of accomplishment that comes with completing a race. As a retiree, he likes running in the mornings and runs two laps at Doolittle Park to keep himself in shape. >> Julius Koskei, 35, from Kenya, won the Top Overall Open Male of the race in 28 minutes, 36 seconds. >> Iveen Chepkemoi, 20, from Kenya, won Top Overall Open Female in 32 minutes, 25 seconds. >> Rolando Ramon, 19, from Edinburg, won First Edinburg Male in 34 minutes, 8 seconds. >> Karla Hinojosa, 33, from Edinburg, won First Edinburg Female in 45 minutes, 15 seconds. There was also $30,000 in prize money with trophies and medals for all the winners.